I mentioned a little while ago that we were getting ready to study the ancient world again…what better way to prepare than to study the modern geography of those areas that were once a part of the ancient Roman Empire? I recently had the opportunity to review Geography I from Memoria Press. Recommended for children grades 4 and up. Geography I will take you on a tour of the Middle East, North Africa, and Europe, sharing a glimpse of ancient civilizations and where they were in relation to today’s political boundaries. 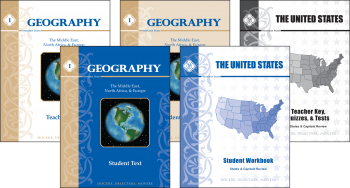 Additionally, this set includes resources for reviewing the United States and their capitals---Memoria Press’ 3rd grade curriculum is a study of US geography and their overall program calls for periodic review of this material. Both parts work together for a year of geography learning and review. Each item is also available individually. Please see the Geography I product page for samples and other purchasing options. Our main focus for this review was the Middle East, North Africa, & Europe materials, but I’ll also be including some pictures of the US books to give you a feel for them. This study is divided up by region (Middle East, North Africa, and Europe), with an introductory article for each region, followed by individual country articles and map work, and finishing with a review and test for that region. I’m using this study with my 7th grader, David. The teacher guide suggests covering 2-3 countries a week. He has completed the Middle East, which covers 9 countries, and has started on Africa. For each country, David reads a page of text and studies the map in the student text. The text includes fun facts, the modern country name, its ancient name, a couple of paragraphs on its ancient history, and a couple of paragraphs on its 20th century history or culture. After reading the text, he records what he’s learned in the student workbook. As you can see, the map work in Geography I requires properly labeling place names, rivers, and bodies of water. The rivers and capital locations are marked and a “word bank” is given, so your child knows at a glance what all he is expected to label. He’ll also record the country’s ancient name, capital, and some fun facts (it is left up to the student to decide which facts to record). The Teacher’s Guide also contains tests for each region in the back. Each region finishes up with with a review of its country locations. One lesson takes David maybe 20-30 minutes, so this is very easy to fit into our studies. As he does each new country, he’s really reviewing the locations of several of them, because he labels all the surrounding countries. Sometimes when you are studying the past, you lose sight of how the where it all happened fits into the here and now. This study is the perfect solution for that problem and it’s a great companion for a study of the ancient world. Geography I really is open and go---there is absolutely no prep! And if your child is a strong reader, it can also be 100% independent. As a Mama with 3 other kids who need my attention, it’s great to have some quality learning going on without any hand-holding. The Teacher’s Guide is easy to read and use and requires no prior knowledge on my part (ahem, because my own geographical knowledge leaves a lot to be desired). Overall this is a simple, painless solution to geography study---I need to keep Memoria Press on my list of possibles for the future (Geography II is also available and it includes a review of Geography I). The United States Review set is an inexpensive way to guard against brain drain. They could also be used to teach the state locations to an older child. To purchase Geography I, please visit Memoria Press. For more reviews of this program, as well as reviews of Memoria Press’ Prima Latina, please visit the Schoolhouse Review Crew’s blog. I love the pictures you included in your review!